For the quickest and easiest way to do this, place the tomatoes, onion, and garlic in your food processor and pulse until well combined and chopped finely. If you do not have a food processor, chop tomatoes, onion and garlic finely. Add the tomato mixture and stir. Bring up to a boil and immediately reduce the heat to low/medium low. Stir to prevent sauce from sticking to the bottom of the pan. Add oregano. Let sauce tick away on low heat until you are ready to serve, or remove from heat. Add basil. 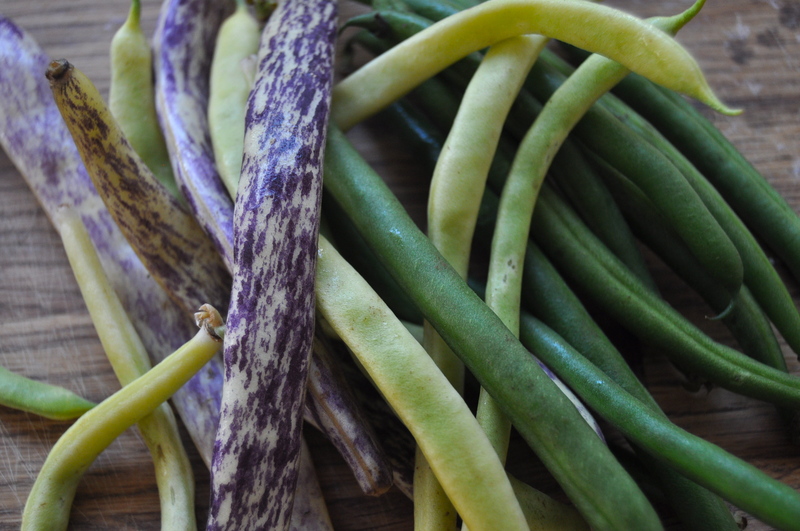 As you are preparing the sauce, cut or snap the stem ends off your beans and snap your beans in half. 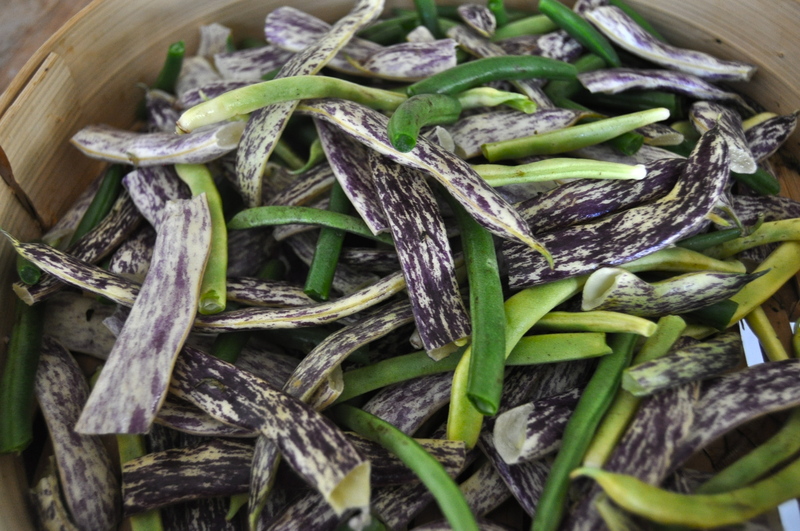 The beans need to be fully cooked before combining with the tomato sauce so steam or boil them (steaming is my preference as all the nutrients stay in the beans- you can pick up cheap bamboo steamers at Asian markets very economically). 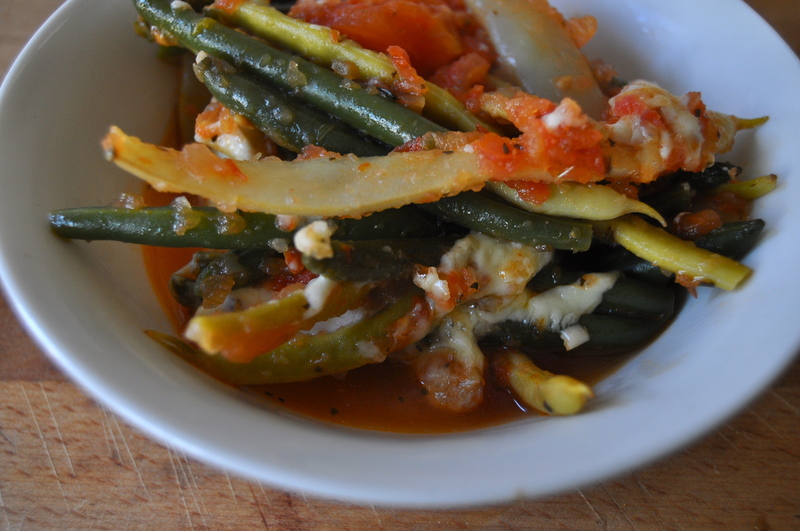 Once beans are fully cooked mix them in a 9×13 (or similar sized) pan with the tomato sauce. Stir to combine. If you are vegan stop here. If not, pre-heat your broiler. Cover the beans with 1-2 cups cheese of choice (cheddar, mozzarella, parmesan, feta, havarti, fontina…) Broil until cheese is browned in spots and bubbling. Remove from oven. Allow to cool for about 10 minutes before digging in. 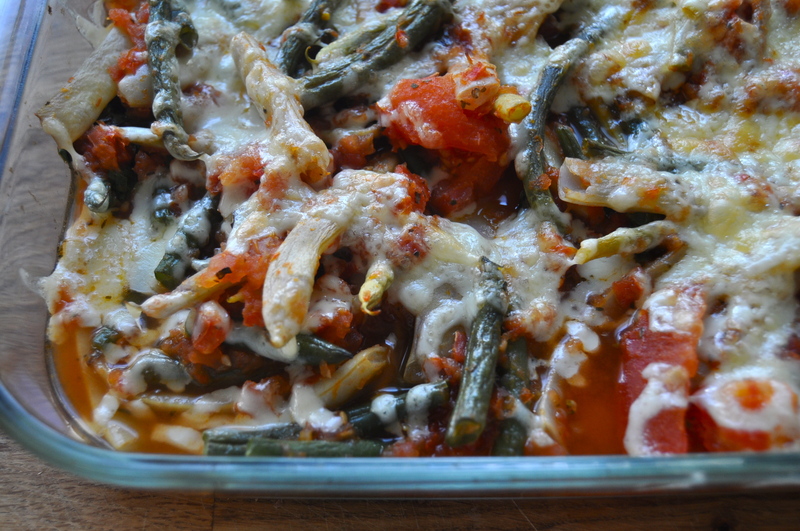 This entry was posted in main, vegan, vegetarian and tagged easy, food, gluten free, green bean casserole, healthy, recipe, summer, tomato sauce, vegan, vegetarian. Bookmark the permalink.